John Davis. The seamans secrets. London, 1626. On display are the tools early modern mariners used—from maps, astrolabes and compasses to books, symbols, and stories—to plot locations and understand their place in the world, both literally and figuratively. Exhibition curator Steve Mentz (personal website) is Associate Professor of English at St. John’s University in New York City. He is the author of At the Bottom of Shakespeare's Ocean (2009), two additional monographs, and numerous articles on Shakespeare, ecological criticism, maritime culture, and related topics. Mentz examined what the ocean takes away, what it gives back and its changing meaning in the world. Instead of sailors once strolling through Manhattan, there are now bankers and lawyers. Mentz said, "In New York, the ocean isn't the heart of the city anymore." Often, the ocean provides instability, Mentz said, and gives back the natural vision of the world. "The ocean represents our alien globe," Mentz said. In Shakespeare's time, the bottom of the ocean could never be touched, but people could reach descriptions of the ocean through the use of the lead line, an early navigating device that measures the depth of the ocean. "We never reach the bottom, but we see what's there," Mentz said. There are also ocean phrases that have entered everyday language. Mentz referenced "the bitter end" and "by and large" as coming from sailors' terms. The word "fathom" also has both the definition of discerning a hidden meaning and a measure of underwater depth. He talked to Shakespeare's use of the ocean in "The Tempest" and specifically, Ariel's song in the first act. With Ariel's song, "The ocean is everywhere and nowhere," It song insists that people look closer at the things at the bottom of the ocean and how the ocean changes them. Ariel's song is narrative and metaphorical, since it draws Ferdinand away from death and transforms powers of the magic of the ocean. As Mentz said, "We never find the treasures that the song promises." In "The Tempest," Prospero educates Miranda of the sea, discusses their exile by sea and the current sea storm that washes people upon their island. Unlike "King Lear", "The Tempest" never shows death by drowning. While "King Lear" addresses land division and fuels much of the plot, there are sea storms and oceanic references, including four places in the play where the earth gives way to the sea. "Shakespeare isn't dead. He isn't even past." Figure (a): NASA's Global Differential GPS (GDGPS) network measured the ground displacement caused by the magnitude 8.8 Chile earthquake on February 27, 2010, in real time at its station in Santiago, Chile. Figure (b): The coastal GPS data were used to calculate the tsunami source energy and drive the tsunami prediction model. Figure (c): The NASA/French Space AgencyJason-1 and Ocean Surface Topography Mission/Jason-2 satellites were used to confirm the tsunami amplitude prediction of the GPS-based model prediction. After the magnitude 8.8 Chilean earthquake on Feb. 27, a team led by Y. Tony Song of NASA's Jet Propulsion Laboratory in Pasadena, Calif., used real-time data from the agency's Global Differential GPS (GDGPS) network to successfully predict the size of the resulting tsunami. The network, managed by JPL, combines global and regional real-time data from hundreds of GPS sites and estimates their positions every second. It can detect ground motions as small as a few centimeters. Song's team concluded that the Chilean earthquake, the fifth largest ever recorded by instruments, would generate a moderate, or local, tsunami unlikely to cause significant destruction in the Pacific. The tsunami's effect was relatively small outside of Chile. Song's GPS-based prediction was later confirmed using sea surface height measurements from the joint NASA/French Space Agency Jason-1 and Jason-2 altimetry satellites. This work was partially carried out by researchers at Ohio State University, Columbus. Song's prediction method, published in 2007, estimates the energy an undersea earthquake transfers to the ocean to generate a tsunami. It relies on data from coastal GPS stations near an epicenter, along with information about the local continental slope. The continental slope is the descent of the ocean floor from the edge of the continental shelf to the ocean bottom. Conventional tsunami warning systems rely on estimates of an earthquake's location, depth and magnitude to determine whether a large tsunami may be generated. However, history has shown earthquake magnitude is not a reliable indicator of tsunami size. Previous tsunami models presume a tsunami's power is determined by how much the seafloor is displaced vertically. Song's theory says horizontal motions of a faulting continental slope also contribute to a tsunami's power by transferring kinetic energy to the ocean. The theory is further substantiated in a recently accepted research paper by Song and co-author Shin-Chan Han of NASA's Goddard Space Flight Center, Greenbelt, Md. That study used data from the NASA/German Aerospace Center Gravity Recovery and Climate Experiment (Grace) satellites to examine the 2004 Indian Ocean tsunami. When the Feb. 27, 2010, earthquake struck, its ground motion was captured by the NASA GDGPS network's station in Santiago, Chile, about 235 kilometers (146 miles) from the earthquake's epicenter. These data were made available to Song within minutes of the earthquake, enabling him to derive the seafloor motions. Based on these GPS data, Song calculated the tsunami's source energy, ranking it as moderate: a 4.8 on the system's 10-point scale (10 being most destructive). His conclusion was based on the fact that the ground motion detected by GPS indicated the slip of the fault transferred fairly minimal kinetic energy to the ocean. "We were fortunate to have a station sufficiently close to the epicenter," said Yoaz Bar-Sever, JPL manager of the GDGPS system. "Broad international collaboration is required to densify the GPS tracking network so that it adequately covers all the fault zones that can give rise to large earthquakes around the world." at a European Space Agency conference in Bergen, Norway this week. 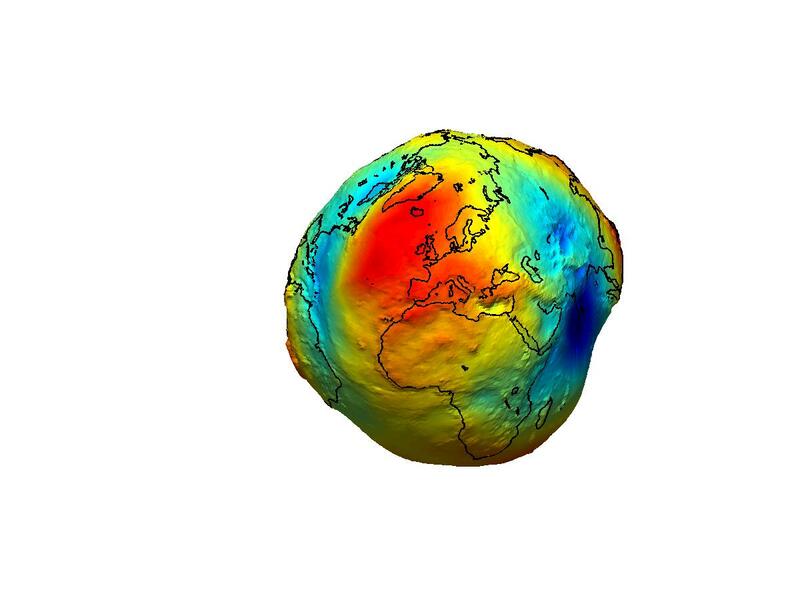 and the geoid, a hypothetical surface of the Earth on which the surface is perpendicular to the gravitational pull. and shows the tiny differences in gravity that exist around the Earth. A satellite launched by the European Space Agency has mapped the entire Earth's gravitation field in unprecedented detail. 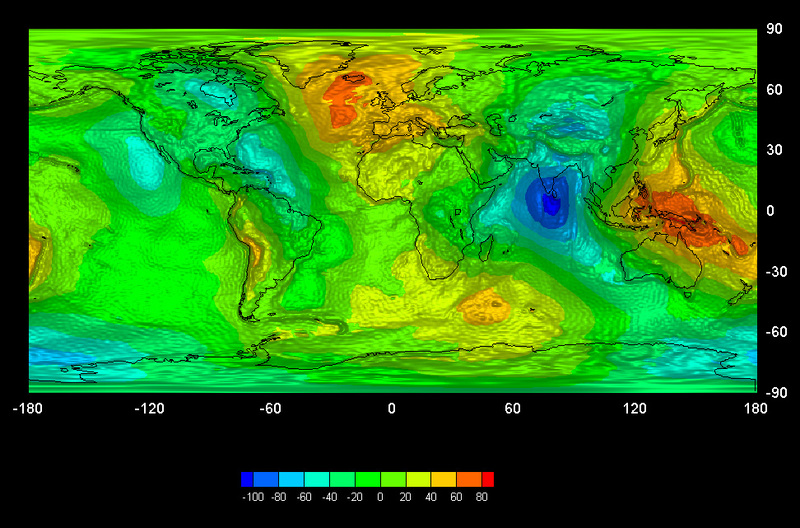 The resulting map, which you can see above, shows where gravity is strong and where it's weak. Blue indicates weak areas, green is average, and orange is stronger. These deviations are a result of the fact that the earth isn't an exact sphere. Instead, it's a bumpy spheroid with some areas higher and some areas lower. The measurements, which have been taken by Europe's GOCE satellite, have allowed scientists to precisely define the geoid -- exactly where a level gravitational surface is across the planet. The satellite, which was launched in 2009, flies at an altitude of 254.9km -- the lowest orbit of any other research satellite. As it flies so low, it's more subject to the pull of gravity -- which helps it to detect minuscule changes in the planet's gravitational field as it flies from pole to pole, but also means that it uses more fuel in its flight to keep it airborne. Scanning the entire world took around two months. The applications are numerous. Climate change researchers model ocean currents very carefully, and so will benefit greatly from knowing how gravity affects the huge masses of water in the oceans. In fact, if there were no winds or currents, it's the shape that the ocean would take on the earth's surface, so comparing the geoid to the shape that the oceans actually take gives us some insight into what the other forces at work are. Elsewhere, the information could be useful to geophysicists who want to know what's happening deep within the Earth, or engineers building a pipeline over a long distance and wanting to know what direction a fluid will naturally want to flow. Prof. Reiner Rummel, the chairman of the GOCE mission advisory group, said: "The computed global gravity field looks very promising. We can already see that important new information will be obtained for large areas of South America, Africa, Himalaya, South-East Asia and Antarctica. Over continents, and in particular in regions poorly mapped with terrestrial or airborne techniques, we can already conclude that GOCE is changing our understanding of the gravity field. 'The satellite is performing extremely well. In fact it's doing better than ESA expected,' says Dr Helen Snaith from the National Oceanography Centre in Southampton, who can't wait to get her hands on the data. 'It's doing so well that ESA has decided to scrap a planned hibernation phase and keep the satellite going until 2013,' says Snaith. Its long operation means that by the end of the mission scientists may have an even more detailed map they expected. The satellite flies in the edge of the Earth's atmosphere and measures miniscule differences in gravity at many points around the Earth using three pairs of highly accurate gradiometers. 'These Earth Explorer missions are based on new concepts. Gradiometers are not quite a new concept, but it's an amazing bit of kit,' says Snaith. Technically speaking the map shows the Earth's 'geoid' - or which parts of our planet have a greater gravitational pull than other parts because of the different rocks it's made of. Stronger gravitational pull is depicted by red, while a weaker pull is depicted by blue. If you turned this map into a globe, it would look like a partially blown-up football, where peaks represent strong gravity and the troughs show slightly weaker gravity. If you placed a much smaller ball anywhere on this squashy football, it wouldn't move – even if it was on a slope – because gravity would be exactly the same all over it. Although during school physics, you probably learnt that acceleration due to gravity at the Earth's surface is 9.8 meters per second squared, this is not strictly true. In fact, gravity differs very slightly all around the planet. 'The current geoid models are largely based on ground measurements, which of course is difficult in inaccessible parts of the planet,' adds Snaith. The geoid model that GOCE has generated is the shape the world's seas would be if there were no winds, tides or currents. Scientists can then subtract the geoid from real measurements of sea surface height to work out how winds, tides and currents affect ocean circulation. 'Until now, the best maps we had were on the 400 to 500 kilometre scale. GOCE's resolution is focussed down to 150 kilometres. Most ocean current are around this width or smaller, so we're going to get a lot more detail about currents with this map,' explains Snaith. 'This map is based on just two months' data. As time goes on, it'll get revised and the resolution will just get better and better,' she adds. Meet EMILY, a robot lifeguard that can operate six times faster than a human lifeguard. You’re caught by the ocean’s riptide, exhausted and barely keeping your head above water. Then your unlikely hero appears: a four-foot-long talking buoy. It’s EMILY, the robot lifeguard. Grab on, and it can bring you safely back to shore. This summer, EMILY (for EMergency Integrated Lifesaving lanYard) began patrolling Malibu’s dangerous Zuma Beach and will watch over about 25 more by December. Although lifeguards operate this version by remote control, next year’s model will autonomously save potential drowning victims as reliably as a human. Once a lifeguard tosses EMILY into the surf, its sonar device will scan for the underwater movements associated with swimmers in distress. Its electric, Jet Ski–like impeller drives it at 28 mph through even the roughest chop, getting a flotation device—itself—to victims six times as fast as a lifeguard would. The ’bot’s camera and speakers will let an onshore lifeguard calm the person and instruct him to wait for human help or to hold on as EMILY ferries him back. The autonomous version will go on sale next spring for $3,500, says Tony Mulligan, CEO of Hydronalix, the Arizona company developing the ’bot, and will work alongside human lifeguards. “Most lifeguards have spent their life in the ocean, learning how it acts. You can’t give that experience to a computer,” says Brandon Chapman, a Zuma beach lifeguard who tested EMILY. Ready for action : EMILY patrols solo or is thrown into the sea from the beach, a helicopter or a ship. Search and rescue : EMILY’s sonar finds a distressed swimmer, and it jets toward him at 28 mph. Mission accomplished : A swimmer holds onto EMILY as it gently brings him to shore or waits for a lifeguard. The robot can travel up to 80 miles on a single battery charge. Ever dreamed of living on a giant island of plastic? Well, with all the plastic that floats around in the ocean as a toxic soup threatening all manner of marine life, one architecture firm has a bold vision to create an eco-paradise called "Recycled Island" in the Pacific Ocean with sustainability at its core. It's a bold plan, but not only would the project help clean the oceans, the firm claims, it might just be a perfect home for climate refugees--and a way to turn those toxic patches of ocean plastic into an island that may do the planet some good. The idea for the massive Recycled Island was developed by WHIM architecture as a way to clean the oceans and create a new floating habitat dedicated to sustainable living, complete with beaches, farms, and buildings. Ideally placed in the Pacific, between San Francisco and Hawaii, the island would be some 4 thousand square miles of plastic 'land' upon which plastic communities would be built. According the project's plan, the plastics used to build the island will come from the giant North Pacific Gyre. Once collected and cleaned, the material could then be reformed into floating platforms of recycled plastic. "This will clean our Oceans intensely and it will change the character of the plastic waste from garbage to building material," says WHIM. "The gathering of the plastic waste will become a lot more attractive." The habitable area is designed as an urban setting. Nowadays already half of the World population lives in urban conditions, which has a huge impact on nature. The realization of mixed-use environments is our hope for the future. The island is constructed as a green living environment, from the point of view of a natural habitat. The use of compost toilets in creating fertile ground is an example in this. It is a self sufficient habitat, which is not (or hardly) depending from other countries and finds its own resources to survive. The settlement has its own energy and food sources. The island is ecologic and not polluting or affecting the world negatively. Natural and non polluting sources are used to let the island exist in harmony with nature. While the plan to build an island by recycling the plastic that pollutes our oceans is certainly a bold one, if not downright impossible, it is in line with a number of ambitious recycling projects that have indeed come to fruition. Certainly, the planet has no pressing need for a new island, sustainable or otherwise, but it would be a huge improvement on the toxic masses of ocean plastic inadvertently in place already. And who knows, maybe Radiohead could write a song about it. Electrolux : turn ocean garbage into vacuums? How did the world's largest living reptile, the saltwater crocodile, reach so many South Pacific islands separated by huge stretches of water despite being a poor swimmer? Apparently, like a surfer catching a wave, these goliaths can ride currents on the ocean surface to cross large areas of open sea, researchers now reveal. The saltwater or estuarine crocodile (Crocodylus porosus) is a ferocious giant that can grow at least 23 feet long (7 meters) and weigh more than 2,200 pounds (1000 kilograms). These scaly monsters have been known to devour sharks, and even attack things they can't eat, often assaulting boats in the mistaken belief they are rivals or prey, biting down with nearly 2 tons of pressure - powerful enough to crush bone or punch through aluminum hulls. These deadly predators hunt in tropical areas throughout eastern India, southeast Asia, northern Australia, and on an untold number of the islands in-between. Although these crocodiles spend most of their lives in saltwater, they cannot be considered marine reptiles the same way sea turtles are, because the crocs rely on land for food and water. There were already many anecdotal accounts of large crocodiles sighted far out at sea, but nothing confirmed. Now, for the first time, using sonar transmitters and satellite tracking, scientists now find that saltwater crocodiles actually do ride surface ocean currents for long-distance travel, enabling them to voyage from one oceanic island to another. "Because these crocodiles are poor swimmers, it is unlikely that they swim across vast tracts of ocean," said researcher Hamish Campbell, a behavioral ecologist from University of Queensland in Australia. "But they can survive for long periods in saltwater without eating or drinking, so by only traveling when surface currents are favorable, they would be able to move long distances by sea." Working at the remote Kennedy River in northeastern Australia, the team of scientists - which included the late Steve Irwin, "The Crocodile Hunter" - tagged 27 adult seawater crocodiles with sonar transmitters, employing 20 underwater receivers deployed along a 39-mile-long stretch of the river (63 km) to track the reptiles' every move for more than 12 months. They found both male and female adult crocodiles undertook long-distance journeys, regularly traveling more than 30 miles (48 km) from their home area to the river mouth and beyond into open sea. The scientists also discovered the "salties" always began long-distance travel within an hour of the tide changing, allowing them to go with the flow. They halted their journeys by hauling out onto the river bank or diving to the river bottom when the currents turned against them. The researchers originally were just aiming to investigate the territorial habits of the crocodiles and how they divvied up land among themselves. "I never thought they would be making these long-distance journeys out to sea," Campbell told LiveScience. After they made their discovery on the river, Campbell and his colleagues re-analyzed archival data from the few crocodiles that have been satellite tracked while undertaking ocean travel. By overlaying the reptiles' movements with surface current estimates, they found the strategy of ocean-swimming crocodiles was similar to what they employed with rivers. One satellite-tagged crocodile, 12.6-foot-long male (3.8 meters) - left the Kennedy River and travelled 366 miles (590 km) over 25 days, timing its journey to coincide with a seasonal current system that develops in the Gulf of Carpentaria. Another croc - a 15.8-foot-long male (4.8 meters) - traveled more than 255 miles (411 km) in only 20 days through the Torres Straits, which are notorious for strong water currents. When the reptile arrived at the straits, the currents were moving opposite to his direction of travel - he then waited in a sheltered bay for four days and only passed through the straits when the currents switched to favor his journey. These findings could explain why this crocodile species did not split into many other species despite occupying islands across such a large range, where in principle populations could have been isolated and diverged from their relatives over time. "Regular mixing between the island populations probably occurs," Campbell said. "Crocodilians have crossed major marine barriers during their evolutionary past." Although scientists now know that salties seem to make long-distance journeys on purpose, "we presently do not know what these are for," Campbell noted. However, it was recently discovered that considerable numbers of the reptiles congregated to feast on an annual fish migration, so these long trips might be a way for the predators to satisfy their hefty appetites. The scientists will detail their findings June 8 in the Journal of Animal Ecology. The South Pacific is still relatively healthy and teeming with fish, but it is a fragile paradise. International fishing fleets are taking a serious toll on the sharks, albatross and tuna, and there are other insidious threats to these bountiful seas.